Welcome to Mansfield! Stay for awhile and enjoy our beautiful Ozarks scenery located in Wright County amid the gently rolling hills of the Ozark Mountain Plateau. 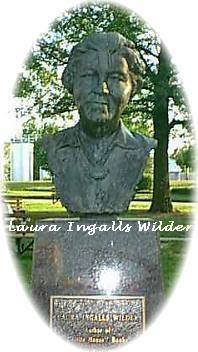 Each year, thousands of people come to Mansfield to visit the Laura Ingalls Wilder-Rose Wilder Lane Historic Home and Museum. Just next door is the Little House Bookstore, where you can purchase books and souvenirs of your visit. The sprawling white frame farmhouse near Mansfield, home to Laura Ingalls Wilder for 63 years, began as a two-room house constructed by Laura and Almanzo Wilder in 1895 using lumber and fieldstone from the surrounding farm. A series of additions were completed by 1912 and give the house its current bungaloid, irregular shape. The modest Wright County homestead is nationally significant as the residence of one of America's most famous authors of children's literature. In this house, beginning at the age of 65, Wilder wrote the Little House series of children's books which tell of her life on the frontier as her family homesteaded in Wisconsin, Kansas, Minnesota, and South Dakota. The books illustrate the struggles and hardships as well as the joys of pioneer life encountered by Laura between the ages of five and 18. A town's future is always shaped by it's history and in Mansfield, we are keeping our history alive as we look forward to the future. Mansfield Missouri is located fifty miles to the east of Springfield, MO, where you can visit Bass Pro Shops Outdoor World, Galloway Craft Village, Wilson's Creek National Battlefield, Exotic Animal Paradise, Dickerson Park Zoo and Springfield Conservation Nature Center. Mansfield's downtown City Square Park is the center of community events and outdoor enjoyment. An historic gazebo stands in the center of the park surrounded by shaded grass areas for picnics, visiting with neighbors, or just walking barefoot through the park! Visit the home where the Little House books were written. The Museum exhibits include artifacts spanning over a century of the lives of the pioneering history described in the "Little House"